You must have Financial Admin Full Access privileges to do this. To view credit card transactions, go to SE Payments Transactions. Chameleon users: In the side menu click Billing Admin > SE Payments Transactions. New CMS users: In the side menu click Business Tools > SE Payments Transactions. From here you have several tools at your disposal. Select a starting and ending date range. Filter by invoice Status (Succeeded, Failed, Pending) and Type (Other, OnDemand, Registration, TUM fundraising, Class). Search for any term, from a name to an amount. Select which columns to view on the screen. Export the currently displayed data set to an Excel Spreadsheet. It always includes all columns. Click a column header to sort by that column. Click again to sort in descending order. 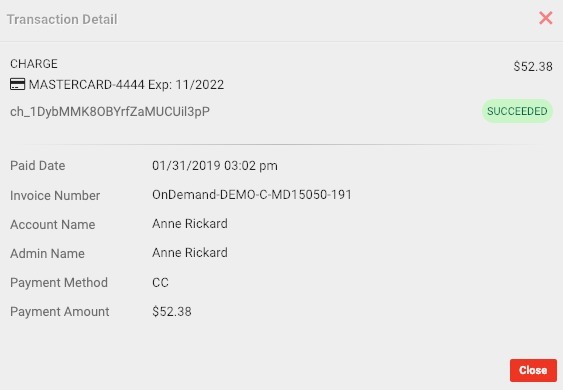 Click anywhere in a row to view that transaction.